I define a local church as any local expression of the Body of Christ. It may meet in one building or several buildings, and it may maintain several Sunday services and any number of other gatherings or ministries. What makes it one cohesive local church is (a) one constitution, purpose, and set of values, and (b) one united eldership team. However, when it comes to numeric size, the key gathering is the congregational worship meeting. A local church may consist of 360 members but if these are distributed into, say, 3 congregations of 120 each then, for the purpose of these discussions, I would consider the church as ‘small’. However, I would consider 360 people consistently meeting in one congregation as constituting a ‘large’ church. In terms of the points I am making, there is little value in differentiating between, medium, large, and mega congregations. In a small congregation, people can easily participate in the worship services by praying aloud, reading out pertinent texts, prophesying, ministering to others, giving testimony… and so on. In a large congregation, such involvement is very limited or even restricted to church leaders and pre-approved congregants. In addition, the number of people performing serving functions constitute a smaller percentage of total attendance in large congregations. Let’s say the number of people participating as members of the worship group, preachers, duty elders, greeters, communion facilitators, those taking up the offertory, etc. come to 20 for a congregation of 100 and 30 for a congregation of 400. 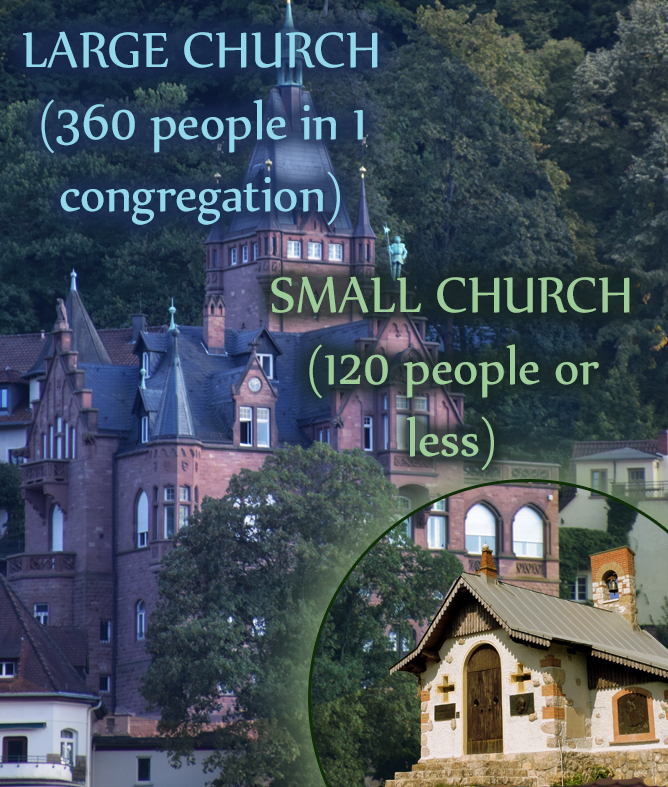 In the small congregation 20% of the people are serving in these ways but in the large congregation, the percentage is just 7.5% (economies of scale). This is also true for other church gatherings such as Junior Church, Mens and Womens ministries and so on. Another observable phenomenon is that the more paid staff there are, the fewer people volunteer for service. Seven to 12 people and no more than 30 in attendance at any one time constitute a fellowship/life/cell group. Jesus had a group of 12 disciples although more than this number followed him as He travelled across Israel. In this kind of group, the key elements/dynamics are intimacy, accountability, nurture, the exercise of spiritual gifts, and the practical application of the message preached in the congregational meetings. The next boundary number is 120 people at any one service, and this constitutes the ideal congregation. There were about 120 people in the upper room on the Day of Pentecost when the church was born. A minimum number of people for a congregation is about 30 and the maximum number around 160 in any given meeting. The key elements/ dynamics of a congregation are the preaching of the Word of God, each person known and knowing others, pastoral care, high participation, and many people involved in ministries in and through the church. Somewhere between 120 and 160’ish the dynamics of the meeting change considerably. People are no longer known and they don’t know most of the others in attendance; opportunities for participation and involvement become limited, strictly controlled, and rule-bound; initiative is taken almost exclusively by designated leaders, and both style and tone of the service become front-led and pre-planned. The larger the church the more immediate influence it can have in a community, the more resources it can muster, and the more people it can attract to its services. Such churches, because of their size and complexity, operate as organisations rather than organisms and require formal structures (usually hierarchical) and highly paid management and specialist staff. In these structures, ‘pastors’ are more chief executive officers than shepherds. The ‘worship group’/band consists of paid professionals, the children’s and youth ministries are highly organised and well resourced, and there are multiple programmes for all ages and genders under the management of paid staff. There is also no doubt that large churches benefit from economies of scale; 40 involved and financially supportive people may be able to sustain a church of 150 but it will only take, say, 60 and not 80 to sustain a church of 300 people. Yet another perceived advantage is the belief that a church can be large yet still foster the core values that are evidenced in the biblical model of church. I think that this is wishful thinking and experience will surely prove this contention wrong. Fortunately, there are countless big churches to use as case studies and diligent research and accurate observation over time will, I am convinced, yield solid evidence. Large churches grow even bigger by attracting people to their campuses and incorporating them into their structures, mainly through elegant facilities, programmes, populist preaching, and high-quality music. Incarnational churches aim to ‘incarnate’ the life of Christ, the Body of Christ, in their area of influence and they grow numerically through one-on-one disciple making and planting other churches much like themselves – just as families do when the children grow up and go off to start families of their own. Small churches can (and I believe should) be governed by a plurality of Elders (an eldership team) while in large churches single leaders or small executive groups usually govern the church. Large churches normally require the services of a Chief Executive Officer, sometimes called an Executive Pastor or Senior Pastor. The ascription ‘pastor’ is misleading in such circumstances because the role is executive management rather than pastoral care. Small churches can function very effectively without titles and without executive managers, and elders can assume portfolio responsibilities and can equip and release deacons to implement policies and respond to needs. The larger the church the more its leadership will be compelled to operate within a business model, but small church leaders are able to be real pastors to the people. Most church leaders believe that we are called to extend the Kingdom of God in our area of influence and that because of this the local church needs to grow numerically. A large church is able to attract and accommodate people more rapidly and consistently than small churches, therefore should we not always aim to have a large church? Well, in my understanding, we are called to make disciples. A disciple is someone who knows Jesus, is growing to be more like Him, and is helping others to do likewise. Can a large church make disciples more effectively than a small church? I don’t think so, and I contend that history and current experience around the world bear this out. However, numeric growth is important and small churches need to work hard and sometimes pay a high price, for ensuring that this happens. But they don’t achieve this numeric growth through seeker-sensitivity, programmes, or compromising other values; they do it through church planting, creating additional congregational services within the existing campus, developing a house church network, or similar strategies. They also recognise that extending the Kingdom of God is most effectively done through inspiring believers to witness to their relationship with Jesus and, within this each-one-reach-one-and teach-one context, to help seekers to encounter Jesus and receive the rebirth of their spirits. This Jesus-taught strategy does not always grow the local church, but it does extend the Kingdom of God in a wonderfully relational manner, and surely the Holy Spirit will draw all reached in this way to some or other local church family. Large churches cost a lot of money. A small church can function with a home, a hall, or even a commercial office as its meeting place. A large church, on the other hand, requires substantial accommodation which invariably means that the members need to purchase an existing church building or build a new one. The capital investment for this is huge and almost always entails a substantial loan. The negative effect of this is that the current members enjoy the current use of the facilities but future members have to pay for it. In my opinion, we should be leaving a legacy not a debt. Another implication is that the leadership are compelled to focus on fundraising from the congregants and this can take the focus off Jesus and His Gospel. However, a positive implication, from a worldly perspective, is that the church acquires a valuable asset and pays for it over time with depreciated currency. But large churches also need a lot of monthly income to survive. Staff costs are huge and the facilities themselves require insurance, maintenance, and constant refurbishment. Small churches do not require massive cash flows in order to thrive. Youth ministries seem to need a big crowd to thrive. Young people like multiple social opportunities and a crowd big enough for them to blend in unnoticed. Small churches just cannot usually create large youth groups unless they join forces with other churches in the area. The critical mass needed for a powerful praise service is also quite high and, once again, small churches are disadvantaged unless they can periodically hire a large facility and bring a number of congregations together for a combined service. I sometimes hear that if church leaders want to be up-to-date and meaningful in today’s world then they need to be part of big or even mega churches. Big churches have been around for a very long time and even mega churches are not a new innovation. Big does not equate to up-to-date any more than small equates to out-of-date. Interestingly, there is some evidence that the so-called Millennial generation are seeking relationships rather than programmes and depth rather than superficiality, and small churches are best able to meet these needs. The contention is that small churches will once again be on the cutting edge of church growth. Here is a link to a short article that deals with this.